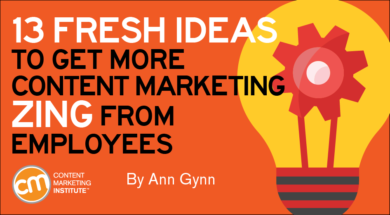 Involving employees in the company’s content marketing strategy isn’t a new idea. Employees already are asked to share content on their social channels. C-suite and subject matter experts often collaborate on thought leadership content. And you likely know the value of connecting with your sales and/or customer service teams to get frontline insight into what your brand’s prospects and customers want to know. But employee-involved content can be much more than that. I put out a call to learn more about how marketers involve their non-marketing coworkers in their content. While many responses reflected the typical examples, several brought a unique perspective and others offered some fresh approaches. The inherent takeaway through all the ideas? Employees can give your content marketing the zing it needs to stand out, be remembered, and build relationships. Now, let’s get to the ideas, tips, and examples. We’re a merged real estate team with a marketing department that handles five brands across many digital platforms. Over the holidays, our team came together to stage a Christmas parody video about Amazon’s HQ2 arriving in Arlington sung to the tune of Santa Claus is Coming to Town. We had dancing elves, agents dressed in Christmas pajamas, a large inflatable reindeer costume, and more. When looking for content partnerships, such as guest blogging, we leverage employees for their contacts. Your first- and second-degree connection list becomes much bigger when you’re able to tap multiple networks instead of just your own. Because of this, we’ve partnered with platforms that would normally be difficult to reach. If staff members attend a seminar, symposium, workshop, or some other type of skill-building (or industry) event – ask them to document their experience. Then you can work with their notes to create a lessons-learned piece based on the event. We did this with one of our developers when he attended a security conference, and it was interesting to see the amount of positive feedback the content received from our staff, other conference attendees, and people interested in the topics covered. Employees at CIENCE help our marketing efforts by participating in day-in-the-life pieces. We’ve produced a number of these to inform future customers about what it’s like to be a researcher, sales development representative, customer success manager, etc. These in-depth articles have helped our sales team relate to customers the future experiences they may have when hiring CIENCE. At Prep Expert, we use some of our employees as customer avatars because of their roles as parents or guardians of children within our consumers’ age range. Our consumers are a specific niche – high school students between their junior and senior years. That’s tough to track. That’s why we’ve looked to our employees who are raising children and know what issues their kids have when studying for these college-prep tests and the common questions that come up when tackling our course. To boost our recruitment marketing, our 100% remote team at Worldwide 101 invented a video series called “Meet the Team” where we interviewed our team members on why they chose to work with us and what their day to day looks like. Each video is personal to the employee and highlights their life and work story in two to three minutes. The videos are now a major driver in us attracting new talent. I’m at Davines North America now and previously at Estee Lauder, Unilever, Nestle, etc. The rapid rise of social media – and the current trend towards, raw, “transparent” content – plays to companies finding a way to ‘open up’ further to the consumers. At Nestle Purina, employees have been featured in videos to show how Purina is passionate about pets by filming employees at home or work with their pets. At Aveda, our head office employees would often be models for our social media hair photo shoots. A wider program #AvedaArtist enables employees in retail stores and stylists in salons selling Aveda to showcase their artistry and share within the community. At Davines, our employees get involved in our community events in New York to help bring the brand to life and capture content at the event, we’re often hair models too. Employees can help answer queries and create awareness on social media platforms such as Quora. Employees can run Twitter chats or ask-me-anything sessions where they can interact with the customers and potential customers. These interactions also can be used in content. Each year starting mid-January we do a piece on weight loss with one or more of our employees. We are in the health and supplement industry, so it matches up with exactly what we sell. We will have two employees doing the weight loss challenge this year along with many of our customers. We include blog posts, videos, social media posts all about their process, their progress and, of course, the supplements they are using. This not only helps us get involved with our community of customers, but also helps us sell more products. I’ve found it’s as important to talk about the culture of your people who are often doing plenty of interesting and noteworthy things that companies can share on their blogs. If you have an employee involved in a lot of volunteer work, a showcase about that person and his or her impact in the community builds goodwill for the business. I’ve found these posts get a lot more engagement than you might expect, which builds your awareness audience for retargeting later. At weekly or monthly staff meetings, dedicate a few minutes to sharing a little bit about the work each person is doing and how that could tie into a larger content piece. You never know what could come of a good old-fashioned team brainstorm. Our employees act as sounding boards for content ideas. Our development team has the freedom to point out a trending question and contribute blog posts whenever they see fit. Readers aren’t looking for “thought leaders” or executives to answer every question they have. The people with the most authority to answer questions are the ones engaging with and solving problems every single day. We involve employees in team meetings and brainstorming sessions. The most important aspect to a creative session is to remember that there’s no such thing as a bad idea, just poorly executed or insufficiently fleshed-out ideas. There are “no-go” words, such as “dumb,” “stupid,” “no”, etc. that everyone agrees are unhelpful to the process. If you can keep your employees’ creativity loose there’s no telling what they can accomplish. To gain the many benefits of employee-involved content – improving brand awareness, lead generation, and ultimately sales – go beyond the traditional tactics. Make your employees the differentiator in your content marketing strategy. Consider one of these 13 suggestions or perhaps let them spark new ideas for your company. Let us know what you do to get employees connected to your content in the comments. Put some zing into your inbox every weekday with the Content Marketing Institute newsletter. Subscribe today.